Today is my third full day in Sauraha Village and despite being peppered with grotesquely lumpy mosquito bites, I am wishing I could stay a little longer in this beautiful riverside village. Having spent Wednesday relaxing and taking in the sights and sounds of Sauraha, I began organised activities yesterday morning starting with a canoe ride down Rapti River and a jungle walk. The Rapti river begins its life high in the Himalaya and is eventually deposited into the Indian Ocean some 1000km away. 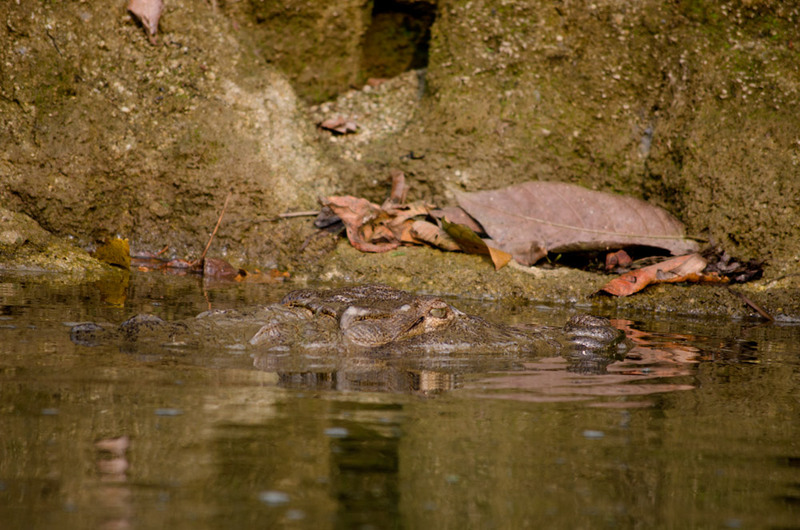 Along our winding route we encountered countless Mugger Crocodiles (one of two species present here in Chitwan). The Mugger can grow up to an alarming 5 meters in length and is an ambush hunter, waiting silently in murky waters to attack its prey. 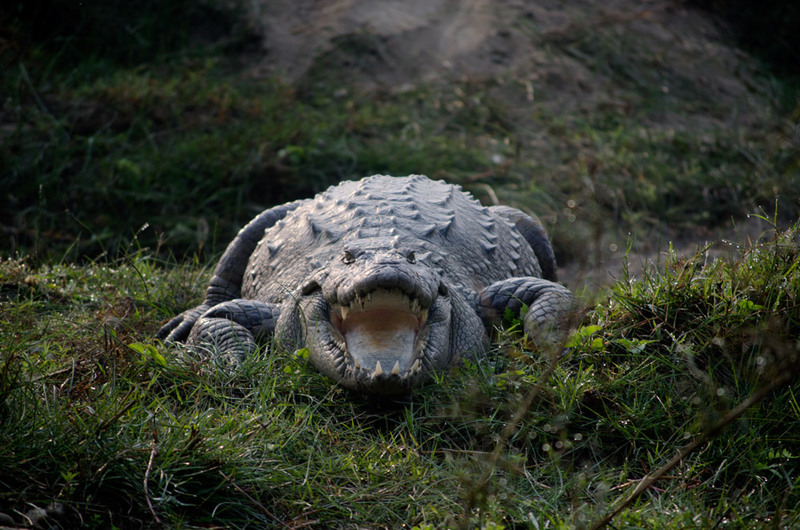 Because of their colossal size and viciousness, these Crocodiles are considered a serious threat to humans. 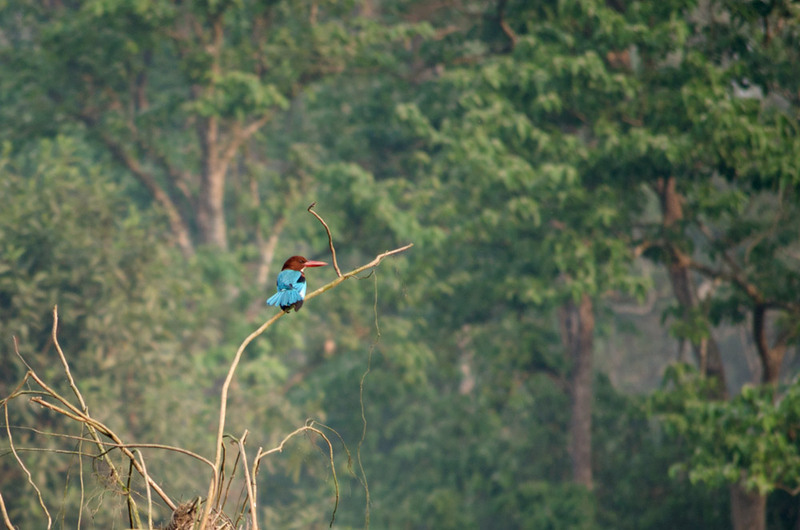 Along the way we also saw a number of birds, including the spectacularly blue White-Throated Kingfisher. 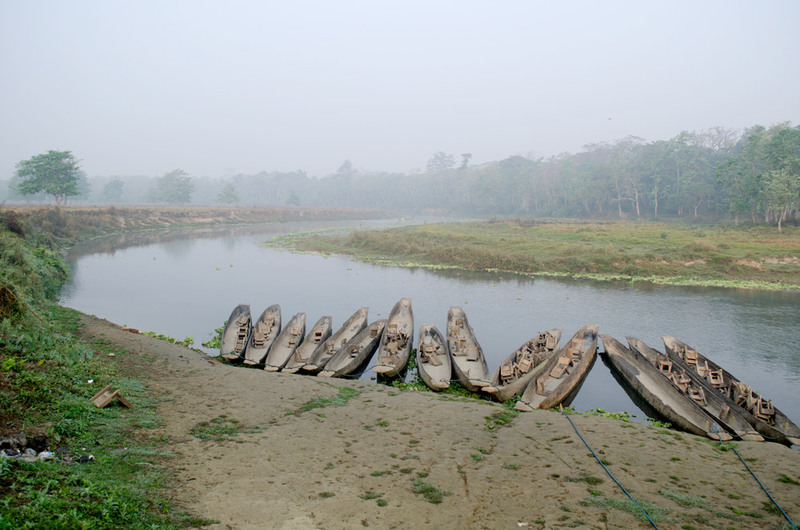 The misty morning I took to the Rapti River by canoe. A White-Throated Kingfisher observes the river. A Mugger lurks in the murky water, his camouflage making him almost undetectable. Muggers are relatively sociable animals and will bask and feed together. This large male, however, basks alone on the banks of the river. 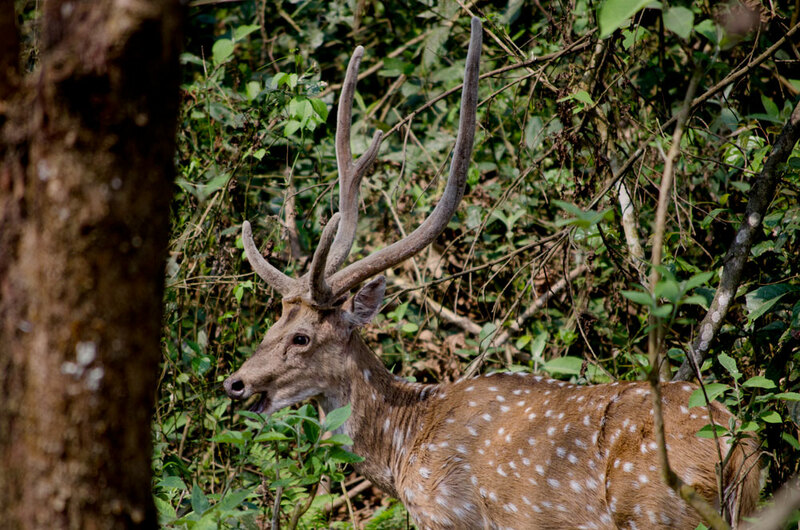 A male Spotted Deer sees us approaching through the foliage during the jungle walk. After a quick lunch of traditional Nepali Dhat Bhat with Aubergine Curry I prepared to leave for my afternoon’s activity; a jeep safari into the Jungle. Starting a little later than scheduled (as per relaxed Nepali timekeeping) we, a group of ten riding together, set out for our 5 hour drive though Chitwan’s different habitats; grassland, riverine and forest. Just a couple of minutes of hurtling down the muddy track and for the first time here enjoying a refreshing breeze, we were stopped in our tracks. One of Chitwan’s Wild Elephants had torn a tree down across the road and was stood looking utterly guiltless in the trees parallel to the jeep. Reversing out of its way, the mammoth mammal ambled across the road and vanished into the Jungle, leaving the park rangers and passengers to dismantle and move the tree. 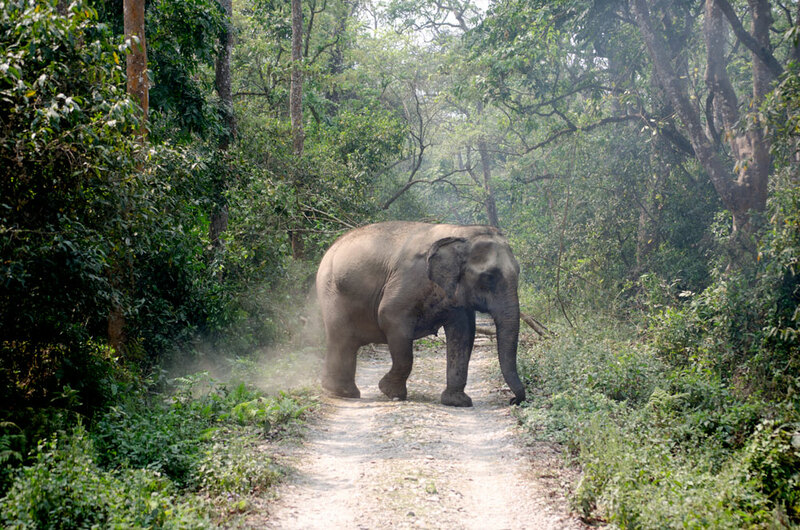 There are fewer than 50 Wild Elephants resident in Chitwan Nation Park, with the 2011 count estimating around 30 individuals. This wild Elephant leaves the scene of his crime unfazed by the commotion he’s caused. Throughout the jeep safari we were also lucky enough to see all three types of deer resident in the park, two types of monkey, Sloth Bears, Rhinos, Wild Boars, Bison and with a trip to the Crocodile Breeding Centre, plenty more crocs too! Being a Documentary Photographer I havn’t really got the kit to photograph wildlife professionally here in Chitwan, but as any photographer will appreciate, its impossible not to give it your best shot! 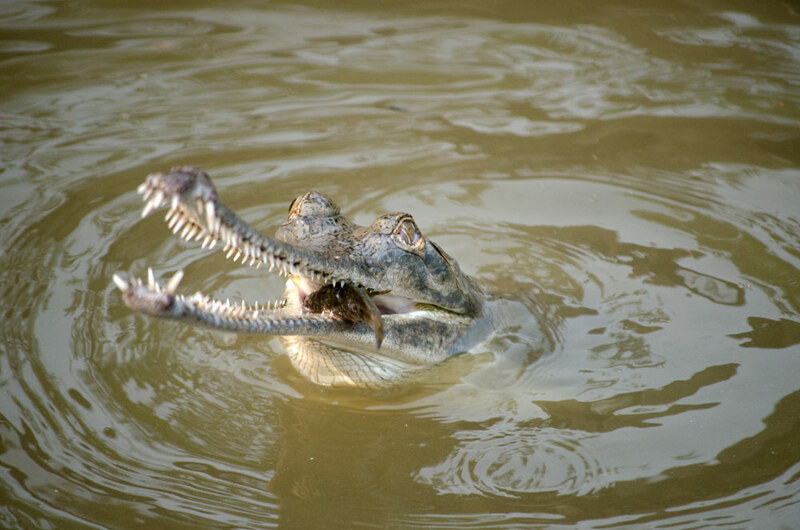 A Gharial Crocodile in the Chitwan Breeding Centre. These animals are classifies as Critically Endangered and whilst crossing the river into the jungle to begin our jeep safari we were fortunate enough to see some basking in the midday heat. 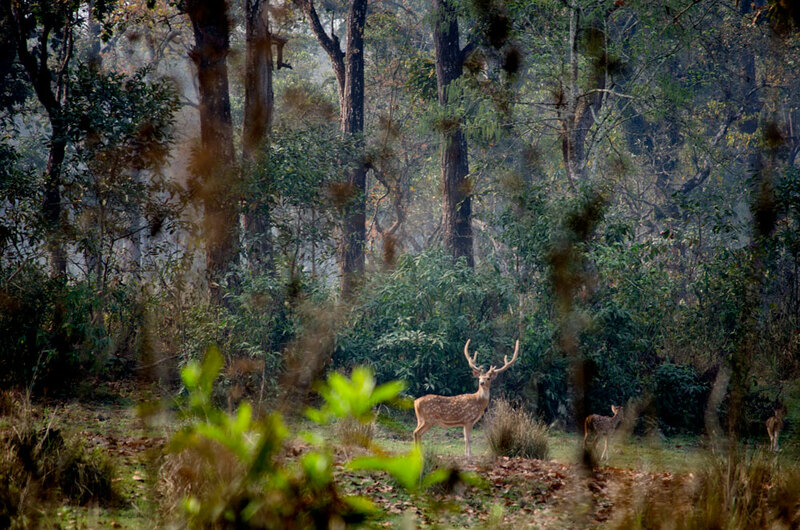 A Spotted Deer through shot through the vegetation of the Jungle. 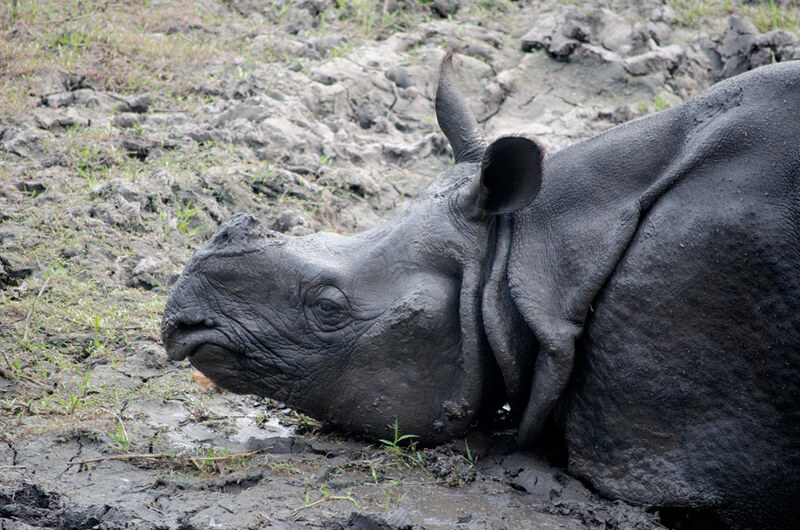 A Greater One-Horned Rhinoceros indulges in a mud bath in the Jungle before disappearing into the tall Elephant Grass. So there’s a taster of what Chitwan has to offer and what I have been up to, there will be more blogs up soon and wi-fi permitting I will continue to upload single images to both facebook and twitter so keep an eye out! For now though, I am going to sit by the river as the sun begins to drop towards the horizon with a Gin and Tonic.